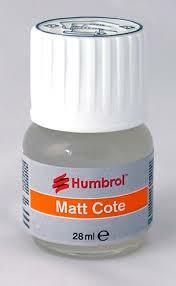 Humbrol Matt Cote is my varnish of choice. I have used it for ten years or more on 15 mm wargames figures and can testify to the makers claims that it is hard wearing and doesn't yellow. You must ensure that the white layer that separates and settles on the bottom is fully mixed back in before use. Matt Cote is opaque because it contains a suspension of silica. It is this that imparts the matt finish. Over time the silica settles as it's insoluble. So if you don't mix it properly before use you don't have enough matting agent and you get a satin, or even a gloss, finish. Sometimes, even after thorough mixing, a bottle will not provide a matt finish. The reason for this is that there's insufficient silica in the bottle full stop. The way round this is to let the bottle settle and remove some of the clear top layer until tests show that the varnish is drying flat. I keep the removed liquor and use it to dilute batches occasionally. If you have an old bottle that suddenly starts to dry gloss simply dilute the varnish with a little white spirit. The varnish dries matt because the silica migrates to the surface during drying. With old bottles there is less solvent due to loss over time. This causes the silica to gel. Mixing disperses the gel but the silica isn't mobile enough and doesn't migrate to the surface. Adding a small amount of solvent disperses the gel and restores the matting properties of the varnish. If none of the above work then try this tip. Add small amounts of plain unperfumed talc to the varnish along with some 4-6 mm glass beads. Sadly there's no hard and fast rule for how much talc you have to add. It's down to trial and error I'm afraid; although in my experience it's hard to add too much. The beads are vital as the talc will cause the matting agent to settle far quicker than before. If you leave the varnish undisturbed for any length of time, a layer of matting agent will gather at the bottom of the jar: the beads will help you re-suspend the original matting agent, and the added talc, before use. Let me know if you have any tips or tricks. Update: Added tip about adding talc.